The wait is over after a long season. Find out who our reporters predict to win it all. 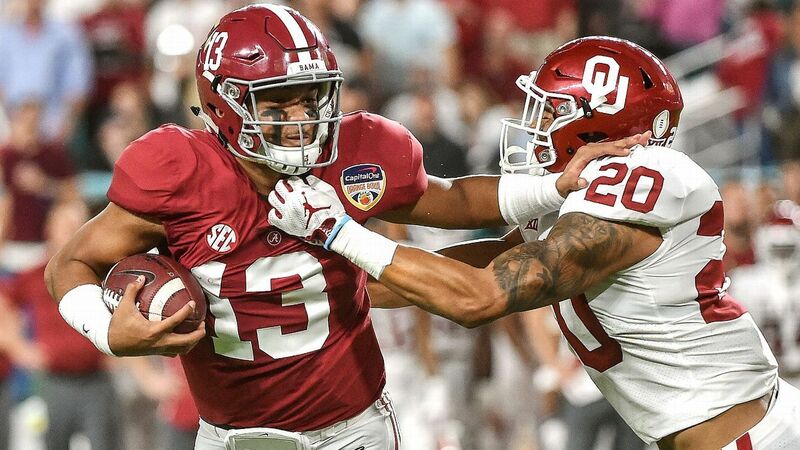 Tua Tagovailoa throws 4 touchdown passes as Alabama withstands Oklahoma's late surge in the Capital One Orange Bowl. For the fourth consecutive year, the championship journeys of the Tigers and Tide feature a must-win showdown in the College Football Playoff. Kyler Murray knew the questions about his future would come, but all he could think about was Saturday's loss to Alabama, saying, "We've got a lot to be proud about, but coming up short wasn't the goal." No grumbling over the fourth Alabama-Clemson CFP game. Why wouldn't you want to watch the Tide play the Tigers for the national title? While Oklahoma's defenders said they knew Alabama had a potent offense, linebacker Kenneth Murray said it was stunning as the Crimson Tide scored 21 first-quarter points en route to a 45-34 win in a College Football Playoff semifinal. Alabama linebacker Christian Miller will have an MRI on his injured hamstring. His status for the College Football Playoff National Championship against Clemson is uncertain. Tua Tagovailoa throws for 318 yards and 4 touchdowns as Alabama survives 417 yards and 3 scores from Kyler Murray to win the Capital One Orange Bowl. Lincoln Riley reflects on the Sooners' 45-34 loss to Alabama in the Capital One Orange Bowl, saying his team proudly fought until the finish. Kirk Herbstreit and Chris Fowler break down Alabama's win including their hot start and also put a bow on a remarkable season for Kyler Murray. Despite throwing for 318 yards and four touchdowns, Tua Tagovailoa says the status of his ankle is "still uncertain." Nick Saban says there's a lot Alabama needs to do to improve, but praises the Crimson Tide's focus in the Orange Bowl vs. Oklahoma. Herm Edwards and the rest of the Film Room react to Nick Saban throwing his headset after an Alabama false start penalty. Nick Saban is always fighting off a new wave of challengers. Dabo Swinney got him once, and Kirby Smart has come close. Now it's Lincoln Riley's turn. Ready to watch No. 2 Clemson vs. No. 3 Notre Dame and No. 1 Alabama vs. No. 4 Oklahoma in the CFP semifinals? Here's all the details on ESPN's coverage. Will Jalen Hurts-Tua Tagovailoa saga have Hollywood ending? The journeys by Alabama QBs Jalen Hurts and Tua Tagovailoa have been anything but predictable. Will the next act set up a Hollywood ending? Oklahoma beat Chris Weinke for Josh Heupel. Texas helped Vince Young get over Reggie Bush's win. Now Alabama gets a shot at Kyler Murray. Can Oklahoma handle the pressure of Alabama's defense? Kirk Herbstreit breaks down the keys for Oklahoma in the Capital One Orange Bowl against Alabama. The 6-foot-5, 325-pound redshirt freshman will battle Outland Trophy winner Quinnen Williams in one of the Capital One Orange Bowl's most interesting matchups. Nick Saban said expanding the field for the College Football Playoff any further would undercut the "self-gratification" for players that comes with going to bowl games. Oklahoma Sooners quarterback Kyler Murray said his "main focus" is on Saturday's game against Alabama, which could be the last competitive football game of his career, but that he hasn't nixed the possibility of playing in the NFL. The Irish and Sooners are big underdogs heading into the playoff semifinals. Here's how they can stun the college football world. Oklahoma receiver Marquise Brown said Thursday his injured foot is getting better, and he anticipates playing against Alabama in the College Football Playoff semifinal at the Capital One Orange Bowl. Time to go bowling! Take a look at the complete bowl and College Football Playoff lineup.